Flying is an amazing thing. We are sure you agree with that. However there are many different ways of flying. In this column the emphasis will be on the great diversity in service offered by airlines throughout the world. We assume all our readers are airline fanatics and some of you have already had the opportunity to fly quite some miles. Therefore, together we form an interesting group of critics when it comes to airlines and service. This column appears in Aerlines on a regular base and gives all you critics out there the chance to share your experiences, good and bad, while flying any airline in the world, with all Aerius-members. The editors would like to stress that the given opinion is a personal one. 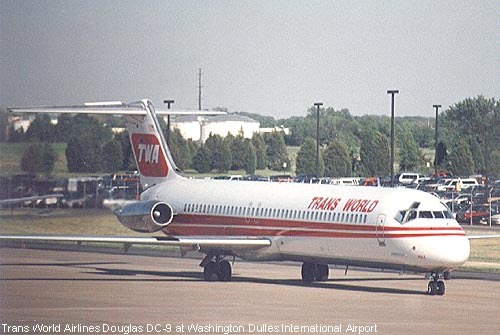 Having tried unsuccessfully to secure a work placement with an airline, in the course of my studies, I was delighted to find out that my school had a roundabout connection with Trans World Airlines in St. Louis Missouri (if only they had told me earlier!). I practically begged and pleaded them to put in a good word for me, and in the end TWA agreed to take me on for a two-month internship after my graduation last summer! I was ecstatic! My first on-hands experience with an airline. Granted not the most successful one these days, but still. The most pleasant surprise came when I received a copy of the contract. I knew I wouldn’t get paid for my efforts, but I took that as an investment in my future. What they would give me, however, was one free air pass for every 40 hour “worked” for them! Which explains the extensive itinerary above; all those trips cost me $0! Since TWA no longer serves AMS, I had the choice between leaving from Paris or London. Having visited LON several times in the past year, I opted for Paris, also to pay a good friend down there a long-postponed visit. That visit, however, turned out to be -‘Longer than planned. I had the misfortune of wanting to get on the plane with a non-revenue ticket at the same time as half of France was prepared to pay full fare for that same privilege! The result was that I was bumped on two consecutive days! 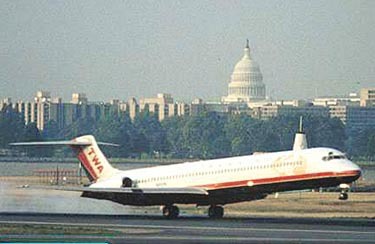 TWA operates to flights out of CDG daily, one to New York JFK, and one direct flight St.- Louis. Both of them were booked solid for the last days of June, and paying passenger were even asked to give up their assigned seats in return for roundtrip free ticket to any TWA destination, and paid accommodation in Paris. I, however, was in a hurry to get to STL and start my internship, soafter two futile attempts to get on that plane, I purchased a ticket to be sure to get there. In the end, I was able to get on the plane four days-later than planned with my non-rev ticket, and thanks to exchange rate fluctuations, I even turned a profit of 100 guilders when I got my purchased ticket refunded! Flying on a U.S. airline for the first time, the first thing that struck me was the average age of the FA’s, which was considerably higher than on European carriers. Personally, I’ve always valued Professionalism over good looks, so that was fine with me. The service left me with no complaints, and also my first taste of the soon to be fami1iar peanuts/pretzels and a soft drink… After the peanuts, a choice of two main courses was offered for dinner. Close to arrival at STL, a cold snack was distributed. 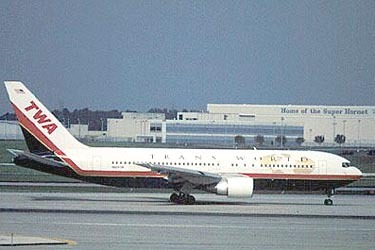 The standard cold snack on TWA flights comes in a small plastic bag, and consists for the most part of a small roll, a bag of potato chips, and an apple., with variations possible. The equipment between Europe and the U.S. consists for the most part of 767-300s, all painted in the new red-and-blue livery. Unlike on domestic flights, headsets for the in-flight movie and alcoholic drinks were distributed free of charge. On routes from London, Cairo, Rome, Milan, and Tell Aviv, two feature films are shown. The first a reasonably recent box office release, the second a classic. Eight audio channels feature a variety of music, as well as a news/debate program. After a couple of weeks in St. Louis, the desire to take advantage of my free passes became stronger (go live in St.- Louis for two weeks and you’ll know why! ), so I went to visit a friend in Tulsa, Oklahoma. The weather that weekend was appalling, with severe thunderstorms in the Chicago area, resulting in heavy delays, also affecting my flight to TU’L, which came through from New York and Cleveland. After one hour delay, however, we took off for a very pleasant one-hour flight to Tulsa. On my way back, it was Tulsa’s turn to be hit by heavy rainfall, and the arriving flight had to circle over the area for half an hour before it was given permission to land. Another hour’s delay. It was with some intrepidation that I planned the itinerary for my Grand Tour before returning to Europe. With my MSP experience still fresh in my mind, I was hesitant to count on nearly full flights, not wanting to risk another unscheduled layover somewhere. I was especially concerned about my first flight to Honolulu, which only operates once a day, and those flight had been full all summer. Much to my surprise, I was able to get on all the flights I had hoped. Part of the explanation was of course that I was travelling largely after Labor Day, which is the first Monday of September, and marks the official end of summer. Schools are back in session, and high season is over. From STL to HNL and back, I flew for the first and probably last time on a TWA 747. The oldest 747s are now around 25 years of age, and TWA judges it too costly to have them modernized for another few years of service, and has decided to retire them all by the end of the year. They still only fly STL-HNL-STL, JFK-TLV, and JFK-FCO. This was the longest flight since making the crossing from Europe, and after awesome approach to Honolulu passing over Waikiki and Pearl Harbor, I was quite happy to get off the plane and be greeted, by a warm and gentle breeze coming into the doorless terminal building. The weather being more or less constant in Hawaii, the terminal actually has no doors, neither airside nor streetside. Quite apart from the sensation of actually visiting places I’d previously only dreamt of (Hawaii, Puerto Rico, San Francisco), my American vacation was a very pleasant experience. As I mentioned, I managed to get on all the flights I wanted, and even was lucky enough to catch a connecting flight from STL to SFO after arriving from HNL with only 17 minutes transfer time! I was very impressed that after eight hours flight, the 747 from HNL arrived exactly at 8:33 AM. in STL, just as scheduled! The 8:50 to SFO left from the gate nextdoor, and I could just walk straight on. 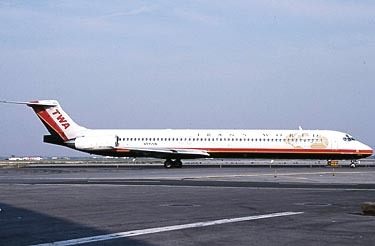 The 757 to SFO was one of the newest aircraft in TWA’s fleet, and that was obvious from the bright and modern interior with small drop-down monitors and in-flight telephones on every seat section. The final segment of my summer’s travels was also one of the most nerve-wrecking. Not the actual flight, just the uncertainty whether I would get on the plane or not. There was a long waitlist for both flights to London on the day I wanted to go, and it was pure gamble whether I would be able to leave that day. I really had to get back and start sorting things out, since my postgraduate course at the University of Westminster would start exactly one week later and I still had no accommodation arranged, which is something I know to be very difficult in London. I’d also brought all my luggage and returned the keys to my summer home, so in order to avoid more expenses for a hotel and a lot of general inconvenience, I HAD TO get on that plane! I was recommended not even to bother with the earlier flight, so I turned up for the later one, which was reportedly fully booked, with a long waitlist. I was sitting at the edge of my seat, as more and more paying stand-by pax were called and cleared to board. As a sort-of employee, I at least had seniority over friends and family of employees travelling on discounted passes, and that turned out to be my salvation, as I was the very last one to be cleared to board the flight! Imagine the sign of relief as I raced down the jetway with the doors closing behind me! The overall impression of my travels and TWA staff is that everyone has been very friendly and helpful, from the ground personnel at CDG, to the Swedish check-in agent at DCA, to the FAs. I would like to extend my thanks to them all, including all my colleagues at TWA head office in St. Louis, for making my summer truly enjoyable and memorable. The Editors wish to thank Mr. Almgren for his kind contribution. At the same time we extend an invitation to you to share your experiences with us. We are convinced that we will be delighted! This column appears in Aerlines on a regular base and gives all you critics out there the chance to share your experiences, good and bad, while flying any airline in the world, with all Aerius-members. The editors would like to stress that the given opinion is a personal one. Most adopted children want to know more about their roots and biological parents. Well, I’m one of them. I was adopted in 1977 at the age of 3 by a Dutch family. Since 1986 I have contact with my biological mother in Korea and we correspond with each other on a regular base. This summer was a good moment for me to visit her (for the first time in 20 years). I was anxious to know how I ended up being adopted and how my family in Korea lived. There are several options to get to Korea. All major European carriers fly to Seoul, but because I had to take a connecting flight from Seoul to Pusan, Korean Air was the best (and the cheapest) option. The connecting flight Seoul-Pusan cost me only 25 guilders more. My flight departed on Monday 14 July at about 23.55 hrs. At the check-in I collected my Skypass miles (Korean Air FFP). Your miles never expire which is a big advantage for the not so frequent flyer like me. I said goodbye to my parents and headed for the terminal. At the arrival information was giving my flight was delayed for an hour. Due to this delay I could face some problems with my connecting flight at Seoul Kimpo. Then there was a gate change. Instead of concourse G4 the plane arrived at concourse F3. Finally at 0.10 hrs a big light blue Boeing 747-400 arrived. At the side of the plane big letters reminded me for the 2002 World Cup Soccer hosted by both Korea and Japan. Finally at 0.50 hrs we departed. The plane was only filled for about 50 percent and almost all of the passengers were Korean. No Dutch or English newspapers were offered (only Korean newspapers) which was a little disappointment. Soon after take off I started to browse through the inflight magazines ‘Morning Calm’ and ‘SkyShop’. Korean Air offered a wide selection of music channels. Two movies and many features would be played during the flight. After about an hour the first meal was served by very good looking flight attendances. When the ‘fasten seatbelt’ sign was turned off the flight attendances took off their jackets of their uniform and they looked more informal. I choose pulgogi, sliced beef in soy sauce (probably most famous dish outside Korea), and it tasted good. Wine and other beverages (except for beer) were served in little plastic cups what really annoyed me because the cups were quite small and I had to ask several times for more. After dinner the lights were dimmed and a movie (Metro with Eddy Murphy) started. Unfortunately I missed all the movies because it was already 3.00 AM and I fell asleep. When I awoke time of arrival was within three hours. The weather was very cloudy and I couldn’t see the landscape below. Then the trolley with the SkyShop, tax-free shopping, was passing through the aisle. They sold many Korean Air merchandise items. Perfumes were quite limited in number. After an eleven hour flight I finally landed at Seoul Kimpo. I had to pick up my suitcase and check in for my next flight. I forgot to ask my travel agent to send me a map of Kimpo airport so I had no idea where to go. When I walked to the information desk I met my brother (he works in Seoul) who brought me by bus to the Domestic Terminal. In retrospect quite a strange meeting, because I didn’t expect him at all. An Airbus 300-600 brought me from Seoul to Pusan. The flight took only one hour and during the flight non-alcoholic drinks were served. Newspapers were (again) only in Korean language, which gave me the impression that Korean Air is mainly focused on their domestic customers. After a short flight I finally landed at my destination, Pusan. Pusan is the second biggest city in Korea with over 4 million inhabitants and in possession of a big harbour. The airport was relatively small for a city this size. After I claimed my baggage I was welcomed by almost my whole Korean family from my mother’s side. It was a quite emotional reunion and I was a little overwhelmed by so much attention. After spending two weeks with my family they decided I had to visit Cheju-do island. Koreans call it their own Hawaii and many Korean newlyweds spend their honeymoon on the island. My family had arranged a bus tour, hotel and a return ticket Pusan-Cheju for a cousin and I. The flight was a domestic flight drill like the Seoul-Pusan flight. After takeoff the stewardesses served coffee, tea and juice. Newspapers were only in Korean. The plane flew at an altitude of approximately 15.000 feet so I could take a good look at the coastline of the Korean peninsula. I noticed that both in Pusan and Cheju the runways and aprons were very bumpy. Taxiing to the gates and runways was almost like a themepark attraction. On the 2nd of August I flew together with my mother and brother back to Seoul for a one day sightseeing. Thunderstorms and bad weather made the trip a turbulent one. Monday the 3rd of August, check-in at Kimpo at 8 o’clock AM. I noticed that Kimpo had a three separate terminal system, two international terminals (one for Korean carriers and one for other international carriers) and one domestic terminal. It was really crowded in the terminal like an ant-hill. At the walls of the terminal you could see the plans for ‘Inchon International Airport’, a new airport which will be built in the sea with a maximum capacity of 120 million passengers annually after the entire project is finished. Gladly the farewell to my mother was not too emotional, but more a goodbye. We will see each other again. At the gate a Boeing 777 (my favourite plane) was waiting. I was quite surprised because normally Korean Air would put on a 747 on this route. It was probably the first long haul flight for this plane because I missed the inflight magazines (only a air sickness bag and a safetycard were present). This time the plane was quite full and no available windowseat this time. A lot of short features were played while serving drinks. The quality of the audio was very good, especially the sound by the features and movie. Diner was a real Korean style dish. A bowl with rice and a little plate with beef and vegetables which I had to mix together with hot sauce. Of course there were chopsticks but also cutlery for people like me who gets stiff fingers after using chopsticks for more then 5 minutes. After lunch a movie, Vulcano with Tommy Lee Jones (NOT recommendable), was played. In my aisle there was a ‘womens only’ lavatory, which made the line for the other lavatory even longer. So going to the toilet was almost like going on an expedition. After more than 11 hours and a pretty smooth flight we finally landed at Schiphol Airport at about 15.00 hours. In conclusion I’m glad I made this trip. I know more about my roots, culture and family in Korea and many unanswered questions are solved now. Korean Air was a good airline for a fair price and gave an extra cultural touch to my trip.